Maximuscle Creatamax Creatine capsules - These Creatine capsules in their original form were very popular and convenient, something you can take to work or stick in your sports bag and glug with your post workout shake.The only Creatine Capsules product we have, and with the added ALC should prove to be a real winner. Creatamax capsules are designed for the endurance, power and strength athletes amongst you (sprinters, boxers, cyclists etc). Creatamax - Creatine capsules are ideal for anyone that doesn't require the large dosages that bodybuilders need. Creatine + Carnitine in easy to take capsules. Creatamax Capsules (CCAP) are one of the most potent Creatine capsules on the market and are ideal for bodybuilders, power and strength athletes such as sprinters, boxers, cyclists, etc, who want Creatine in simple easy to take capsules. CCAPs have clinical evidence showing how they could improve lean muscle and size in conjunction with your training programme. CCAPs contain the purest Maxpure™ Creatine Monohydrate along with L-Carnitine, an ingredient with a great reputation and very popular amongst bodybuilders and endurance athletes alike. 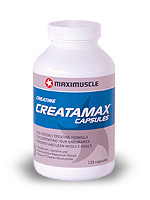 Creatamax capsules when used as directed, will seriously support your training and physique goals. In fact, we know that when you compare Creatamax Capsules to any other on the market you'll be impressed. Feel the difference with Creatamax capsules. * Supports muscle & strength goals. Want even better discounts on Maximuscle supplements? Check our Trade Price Maximuscle Supplements store!